Okay, it’s January so everyone is on a health kick. Well, at least for a few days anyway. I suppose some people even last a few weeks or the whole month, but personally, I tend to not make New Year’s resolutions based on food. I’d rather eat what I like all year and just find recipes that my family and I love to eat that also happen to be healthy. Mind you, I’m really good at finding recipes that aren’t so good for us that we eat too. 🙂 Ah… it’s easy to say moderation, but harder to apply it. After my kids stayed with their grandma for a few days last summer she did comment that my kids asked her what was for dessert every single night after dinner. Ooops. Guilty. We like dessert at our house. Mike likes it. The kids like it. I like it and I like to make it. Gulp. I experimented with this recipe in September. I love it because it’s fast enough to make for a quick lunch, but it saves really well so that I can make Mike and I lunch to have for the next couple days. And let’s face it, grabbing a tupperware container in the morning is a whole lot easier than actually making a sandwich or something before work. 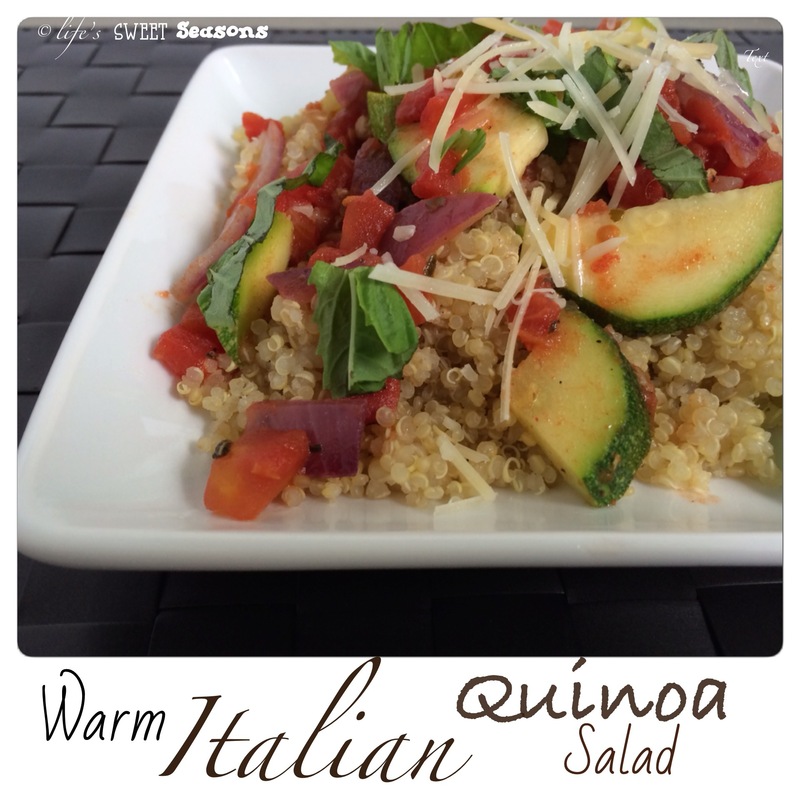 We’ve tried and liked a bunch of different varieties of quinoa salad, but I’m posting this first because it’s mine. 🙂 I don’t have to reference anyone else at the bottom and I’m happy about that. Yea, me! 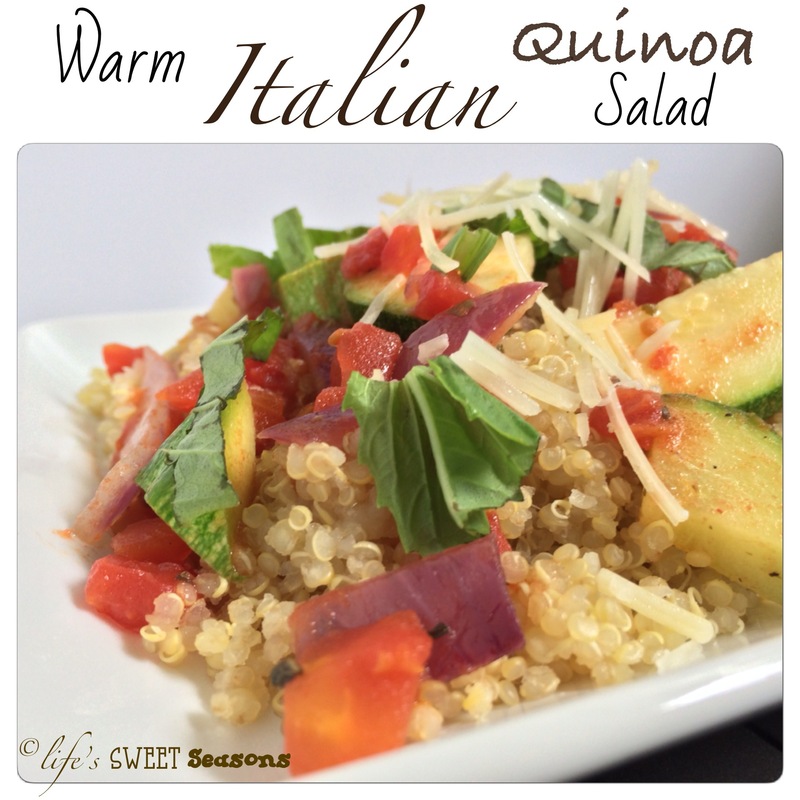 Rinse one cup of quinoa and then pour into a small saucepan. Add the can of chicken broth. Bring to a boil over medium heat. Let boil for one minute and then cover and turn down so the broth is simmering. Allow it to simmer for about fifteen minutes and then turn off the heat, but allow it to remain covered. You wi ll know it’s done when the quinoa has absorbed the chicken broth. Drizzle 2 tablespoons of olive oil around a large frying pan on medium heat. Add onions and sauté for about two minutes. Then add garlic for another minute. Add zucchini and season the mixture with salt and pepper. (I always use fresh cracked pepper.) Cook vegetables for another two minutes. Pour can of diced tomatoes into the frying pan with the sautéed vegetables and stir. Add 2 teaspoons of Italian seasoning and basil and mix. Once the mixture begins to simmer, it’s done! 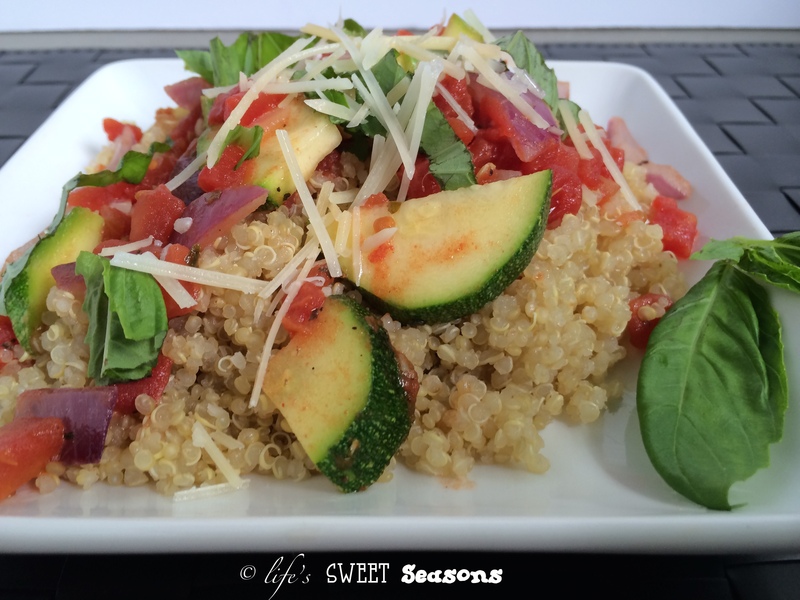 Add the quinoa to the tomato-veggie pan and mix well. Garnish each plate with parmesan cheese and more fresh basil on top! Notes- Serves 2-4. I like my veggies to still have some crunch. To me, there’s nothing worse than a soggy vegetable. So if you prefer soft vegetables you might want to sauté them a little longer and/or simmer them with the tomatoes for a tad longer.